On their own, X, C, and V are just three random letters. But combine them with the Ctrl key, and you get one of the most iconic keystroke trios in the history of computing. Cutting, copying, and pasting data is something we all do on a daily basis, so doing it more efficiently can translate into major time savings. 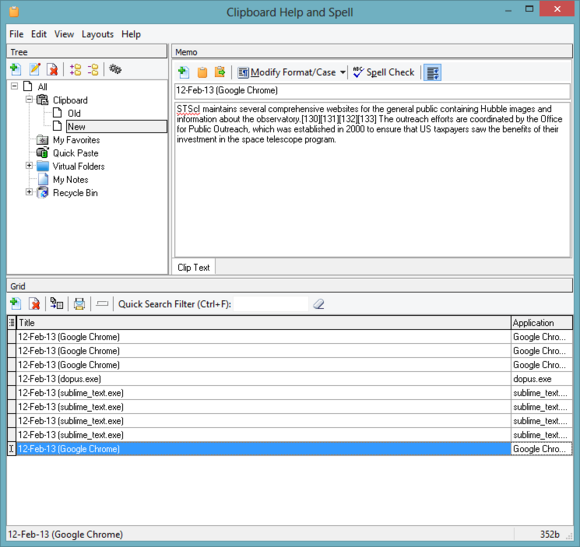 Clipboard Help+Spell is a donationware utility by Mouser that does just that. You may recall developer Mouser from other hits such as Find and Run Robot, Snapshot Captor, and Web Link Captor. And indeed, Clipboard Help+Spell carries his distinctive style: comprehensive Options dialog, multiple interface layouts, and other niceties that add up to the feeling that if you just dig deep enough, you can get Clipboard Help+Spell to do just about anything. 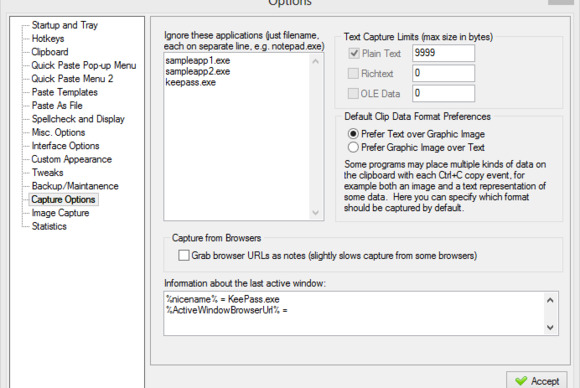 Clipboard Help+Spell's default layout can appear confusing at first. Much like competitor ArsClip, Clipboard Help+Spell features a powerful pop-up menu that lets you use most of the application's features without having to switch away from the program in use. The menu shows a list of recently copied text snippets, any of which take just a single keystroke to paste in at the cursor. You can also set aside a bunch of favorite clips so that you always have them handy, paste the current date and time in multiple formats, format selected text in various ways (such as title and sentence case), and many other features. 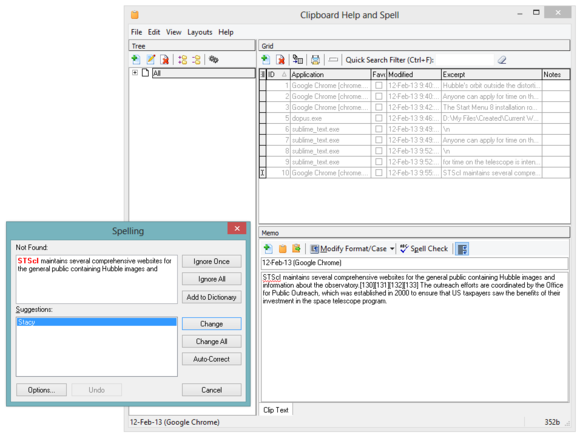 True to its name, Clipboard Help+Spell does contain a spellchecker, but it's not very visible in daily use. One of the nicest Clipboard Help+Spell features is called the Stack. At any point during your work, you can pop open the menu and set a "start stack" marker. Clipboard Help+Spell then records the series of items you copy, and lets you paste them back in the same sequence, one by one. This is very useful when transferring information manually from a text document into a spreadsheet, for example. You can just focus on finding and copying the information, and paste it into the spreadsheet later. That’s much faster than having to constantly switch back and forth between the document and the spreadsheet. Clipboard Help+Spell lets you quickly transform selected text in a number of sophisticated ways. 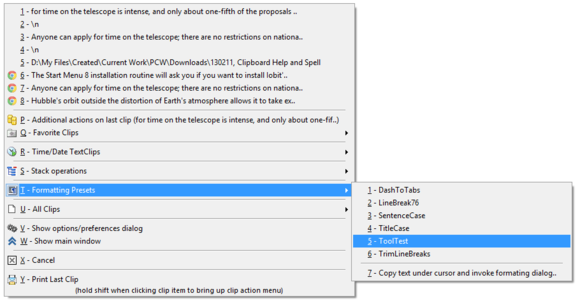 Clipboard Help+Spell does have a built-in spell-checker, but you can't use it through the pop-up menu: You need to switch to the program's main window and select a clip to work on. You can then read through the clip and hunt for words with a red squiggly underline (just like in Microsoft Word), or execute a spell-check on the snippet, which pops open a spelling dialog on every error. So, spellchecking is available, but it isn't the star of the show. 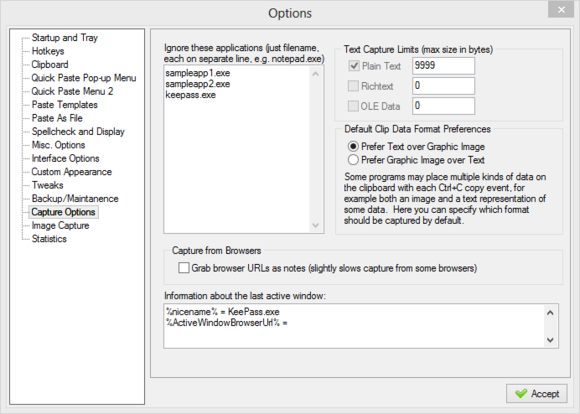 Like many of Mouser's utilities, Clipboard Help+Spell is brimming with customization settings and options. In truth, most Clipboard Help+Spell users probably won't scratch the surface of this complex and powerful beast. But even if you only use 10% of what it has to offer, you'll still end up with a more powerful and flexible, clipboard. Try it out. Clipboard Help+Spell is simple and effective, and can save you time even if you use just a small subset of its features.